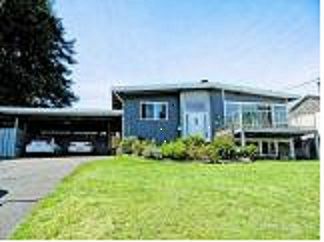 Stunning home with direct ocean view on large lot in Departure Bay.Walking distance to the beach and rec centre. This 1965 executive home includes a massive and bright open living room/ dining room area with feature wood burning fireplace and view deck. A large L-shaped kitchen with modern appliances overlooks the covered back patio and private grassy back yard with garden beds. Downstairs are 2 more large bedrooms, open family room with views, 2 bathrooms, and a storage/utility/laundry room. Downstairs currently rented. shower area of 2nd bathroom currently used for tenant laundry but can be easily be re-installed. Outer buildings include a wired workshop and additional garden shed. Additional storage in lockoff area under carport. Top of carport could be developed into additional deck with panorama views.